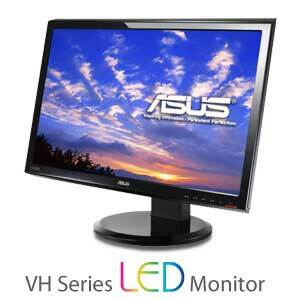 ASUS VH Series monitors are the ideal choice for performing nearly any PC task with amazing Full HD visual clarity. With fast response times ranging from 2ms to 5ms, enjoy smooth motion playback for games, videos, and movies. All VH Series monitors feature built-in speakers for convenient, clutter-free audio connections directly from the monitor. Using LED backlights, these monitors deliver energy-efficient operation and an overall brighter luminance. Most models feature cable management designs that let you seamlessly hide wires from sight for a clean, clutter-free setup. These models feature tilt adjustments so you can better customize your monitor angle to best suit you. They also come in a wide variety of sizes to fit your intended area of use. The VH series is ENERY STAR certified to save money on energy costs.